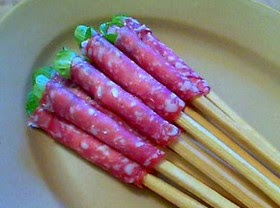 Food Wishes Video Recipes: Calabrese Lollipops – Antipasto on a stick! This is an extremely easy and fun appetizer perfect for a cocktail party or wine tasting event. In fact, this item was created for a wine and food pairing at the fabulous Frick Winery in Sonoma, CA. Bill Frick produces some amazingly delicious wine, and it’s always a pleasure to pair food with (and very easy, since everything tastes great with them). As you can see from the ingredients below, you can do multiple variations this by switching the meats, cheese and greens. It’s also great since your guests fingers will stay perfectly clean do to this item’s brilliant construction! By the way, the “Curb Your Enthusiasm” reference at the end of the clip is only funny if you’ve seen the show (although, it may not even be funny if you have!). arugula leaves, or spinach, baby romaine, etc. What a great idea Chef John! I'm not a meat eater, but if I was, these would be such a wonderful party idea. Kids of all ages would have tons of fun eating these. I know you put the salami hanging on Tastespotting, but these would be a worthy photo as well. Keep up the good work. these were so good! thanks for the idea. I'll most def. be making them for many parties to come. you are awesome chef john!!! thank you so much for sharing some of your recipies. Would this be good using prosciutto instead of the salami? Before assembly, carefully ... neatly ... cut breadsticks in half, so only an inch or so sticks out the bottom of the sopprasetta; just enough to hold onto! Made this for a party of about 35 yesterday. Big hit! Was sought out for compliments!!!!! Made 72 JUST before the party. Didn't think about it, but after an hour and half or two, the bread sticks start getting pretty soggy. Still good but not the same as fresh. I made these and they were a hit. The only caution I have is to not make them up too far in advance as the breadsticks got a little soft under the salami and cream cheese. I will be making more of these this Christmas Holiday!! Made these New Years Eve and they were AWESOME!!! Everyone at the party kept asking for more! Is chef john the man or what? Keep on cooking my friend! these are so tasty and fun to eat i make them often. lately i've been using pretzel rods in place of bread sticks and like them better. I've made these a bunch of times and they're always a big hit. Then my supermarket closed and I couldn't find bread sticks at the new one I went to so my wife suggested trying pretzel rods and they're even better. I'm making these as a snack and as an appetizer when I need a five course dinner and I make the Rocket Bean recipe so often I always have arugula on hand. Make it; it's tasty and so worth it.